← Five-Century House Tour in Canada’s Oldest Town! The Annapolis Royal Historic Gardens is offering an opportunity to take photos with your bikes inside the Gardens in conjunction with the Wharf Rat Rally. There are two options: Self Serve and Full Service. * In Self Serve, you can bring your bike(s) into the Gardens with you, accompanied by a staff person for safety reasons, and take pictures of your friends and your bikes with your own camera. This opportunity is free with your Gardens admission, which, by the way, is discounted for Wharf Rat Rally participants (2-for-1). Just let them know when you visit the Gardens that you’d like to participate in their Photo Opp, and that’s all it takes! * In the Full Service option, you will have the services of The Garden Shutterbug or another shutterbug volunteer who will accompany you and take photos of you and your bike. A CD will be made for you of your photos, and other Historic Gardens and Rally photos – your CD will be available for pickup later in the weekend at the Bainton Tannery Outlet booth in Digby! This specialized photo opp is an additional charge of just $20, and $5 each for additional photo CDs. And of course, this option requires advance bookings. If you’d like to have the Full Service Experience, send the Historic Gardens a note to book your time for Photos in the Gardens: You & Your Bike! The Photo Shoot will take 15-30 minutes, and before or after your booking you are welcome and encouraged to explore the Historic Gardens (on foot, of course!). This entry was posted in Explore Annapolis Royal, Gardens. Bookmark the permalink. 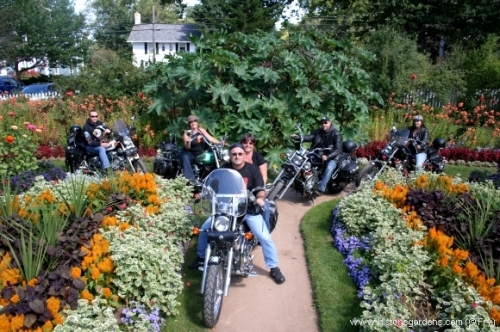 Thanks so very much for your nice comment about our Hawg Photo Op in the Annapolis Royal Historic Gardens post. We are happy that you enjoyed it and felt it worthy of a Trackback on your website.